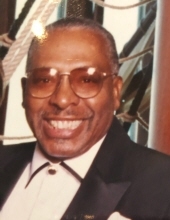 Green, William Henry, 84, of Louisville died Saturday February 23, 2019 at the Hosparus Inpatient Unit of Louisville. Dill, as he was often known as, was a retired electrician for the DuPont Corp, a Korean War Army Veteran and a Baptist by faith. He is survived by a daughter Bridgett C. Childress (John); a sister Vanessa Ross; 3 grandchildren; 4 great grandchildren; 1 niece and 2 nephews. His funeral service will be held 2:00 p.m. Friday March 1, 2019 at W. P. Porter Mortuary 2611 Virginia Ave. Visitation will be 12:00 p.m. to 2:00 p.m. Friday. He will be buried 1:00 p.m. (central time) Monday March 4, 2019 at the Kentucky Veterans Cemetery West Hopkinsville, KY.
To send flowers or a remembrance gift to the family of William Henry Green, please visit our Tribute Store. 5817 Fort Cambell Blvd . "Email Address" would like to share the life celebration of William Henry Green. Click on the "link" to go to share a favorite memory or leave a condolence message for the family.